Last week brought our first cold front here in Northern California, as well as my first pesky cold of the season. I used the opportunity to test a new winter soup recipe—Kale and White Bean With Golden Beets and Spicy Sausage—and it was a success! 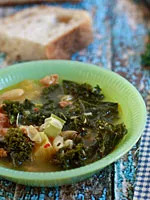 Full of healthy kale, beets, carrots, and beans, this soup will surely perk you up. Other meals this week include a delicious breakfast quesadilla loaded with scrambled eggs, goat cheese, spinach, and sausage, and a vegetarian fried rice that's the perfect solution to using leftovers from dinner earlier in the week. Enjoy! Sip a bowl of this healthy soup to ward off pesky colds! 1. Heat olive oil over medium-high heat and add thinly sliced leeks. Saute for 5 minutes, then add sausage. 2. Brown sausage, then add carrots, beets, and celery. Toss to combine and continue cooking for another 6 minutes. Add kale and beans and cook until kale just starts to wilt. 3. Add chicken broth, salt, red pepper flakes, and pepper, and bring to a boil. Cover, reduce heat, and simmer for 25 minutes. 4. Serve with warm, crusty, sourdough bread on the side. 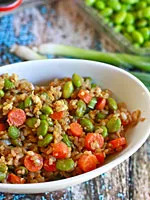 A great way to use up leftover brown rice from the night before! 1. Bring water to a boil. Add rice and pinch of salt, then cover, reduce heat to low, and simmer for 30 minutes. When done, take rice off heat, remove top, and fluff with a fork. Set aside. 2. In a large skillet (or, even better, a wok), heat sesame oil and coconut oil over medium-high heat. Once hot, add sliced baby carrots and edamame. Stir-fry for about 5 minutes, or until carrots become a little tender. Crack egg into pan and fry with veggies. 3. Add rice, soy sauce, and green onions, and toss to combine. Cook for another 3 to 4 minutes, or until heated through. Drizzle in additional sesame oil and serve. Who says you can only eat breakfast foods in the morning? These make a great relaxed weekend lunch or even a light dinner! 1. Scramble eggs over medium-high heat in a lightly buttered skillet. Remove from stove, scoop eggs into a small bowl, and set aside. 2. Heat remaining butter over medium heat in a large skillet. Place a tortilla at the bottom of the skillet, add a small scoop of the scrambled eggs, some sausage pieces, spinach, and a large sprinkle of both mozzarella and goat cheese. Place the other tortilla on top and cook until golden brown on both sides. Repeat with remaining ingredients and serve.